Ottawa is the capital of Canada and the country's fourth largest city, as well as the second largest city in the province of Ontario after the provincial capital of Toronto. It is located in the Ottawa Valley on the eastern edge of the province of Ontario, 400 kilometres (250 mi) east of Toronto and 190 kilometres (120 mi) west of Montreal. Ottawa lies on the banks of the Ottawa River, a major waterway that forms the border between Ontario and Quebec. There is no federal capital district in Canada; Ottawa is a municipality within the Province of Ontario. 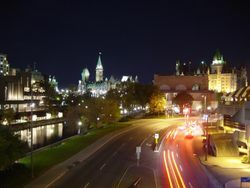 Although it does not constitute a separate administrative district, Ottawa is part of the officially-designated National Capital Region, which includes the neighbouring Quebec municipality of Gatineau. In 2005 the population of Ottawa was estimated at 859,704, while the population of the larger Census Metropolitan Area was estimated at 1,148,785. From Ottawa to Montreal, in the Montreal-Ottawa Corridor, there reside about 5.7 million people. 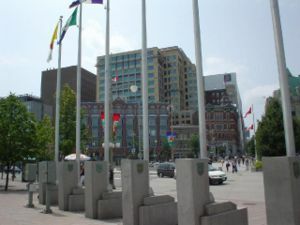 Ottawa has a significant francophone population, and under city government policy, all municipal services are available in both English and French. The current mayor of Ottawa is Larry O'Brien, who succeeded Bob Chiarelli at a ceremony held on December 1, 2006. The Ottawa region was long home to First Nations peoples who were part of the Algonquin. The Algonquin called the river the Kichi Sibi or Kichissippi, meaning "Great River". The first European settlement in the region was that of Philemon Wright who started a community on the Quebec side of the river in 1800. Wright discovered that transporting timber by river from the Ottawa Valley to Montreal was possible, and the area was soon booming based almost entirely off timber. In the years following the War of 1812, in addition to settling some military regiment families, the government began sponsored immigration schemes which brought over Irish Catholics and Protestants to settle the Ottawa area, which began a steady stream of Irish immigration there in the next few decades. Along with French Canadians who crossed over from Quebec, these two groups provided the bulk of labourers involved in the Rideau Canal project and the booming timber trade, both instrumental in putting Ottawa on the map. The region's population grew significantly when the canal was completed and constructed by Colonel John By in 1832. It was intended to provide a secure route between Montreal and Kingston on Lake Ontario, by-passing the stretch of the St. Lawrence River bordering New York State (with the 1812 conflict with the U.S.A. being in recent memory). Construction of the canal began at the northern end, where Colonel By set up a military barracks on what later became Parliament Hill, and laid out a townsite that soon became known as Bytown. Original city leaders of Bytown include a number of Wright's sons, most notably Ruggles Wright. Nicholas Sparks, Braddish Billings and Abraham Dow were the first to settle on the Ontario side of the Ottawa river. Ottawa became the centre for lumber milling and square-cut timber industry in Canada and, in fact, for North America as a whole. From there, it quickly expanded further up (or westward along) the Ottawa River, and logs were boomed by raftsmen great distances down the river to the mills. Bytown was renamed Ottawa in 1855. On December 31, 1857, Queen Victoria was asked to choose a common capital for the then province of Canada (modern Quebec and Ontario) and chose Ottawa. There are old folk tales about how she made the choice: that she did so by sticking her hatpin on a map roughly halfway between Toronto and Montreal, or that she liked watercolours she had seen of the area. While such stories have no historical basis, they do illustrate how arbitrary the choice of Ottawa seemed to Canadians at the time. While Ottawa is now a major metropolis and Canada's fourth largest city, at the time it was a sometimes unruly logging town in the hinterland, far away from the colony's main cities, Quebec City and Montreal in Canada East, and Kingston and Toronto in Canada West. In fact, the Queen's advisors had her pick Ottawa for three important reasons: first, it was the only settlement of any significant size located right on the border of Canada East and Canada West (Quebec/Ontario border today), making it a compromise between the two colonies and their French and English populations; second, the War of 1812 had shown how vulnerable the major cities were to American attack, since they were all located very close to the border while Ottawa was (then) surrounded by a dense forest far from the border; third, the government owned a large parcel of land on a spectacular spot overlooking the Ottawa River. Ottawa's position in the back country made it more defensible, while still allowing easy transportation via the Ottawa River to Canada East, and the Rideau Canal to Canada West. Two other considerations were that Ottawa was at a point nearly exactly midway between Toronto and Quebec City (~500 km/310 mi) and that the small size of the town made it less likely that politically motivated mobs could go on a rampage and destroy government buildings, as had been the case in the previous Canadian capitals. 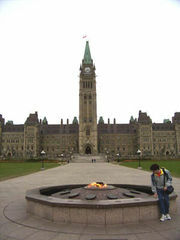 The original Centre Block of the Parliament Buildings in Ottawa was destroyed by fire on February 3, 1916. The House of Commons and Senate were temporarily relocated to the recently constructed Victoria Memorial Museum, currently the Canadian Museum of Nature, located about 1 km south of Parliament Hill on Metcalfe Street. A new Centre Block was completed in 1922, the centrepiece of which is a dominant Gothic revival styled structure known as the Peace Tower which has become a common emblem of the city. 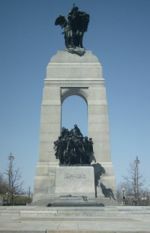 On September 5, 1945, only weeks after the end of World War II, Ottawa was the site of the event that many people consider to be the official start of the Cold War. A Soviet cipher clerk, Igor Gouzenko, defected from the Soviet embassy with over 100 secret documents. At first, the Royal Canadian Mounted Police (RCMP) refused to take the documents, since the Soviets were still allies of Canada and Britain, and the newspapers were not interested in the story. After hiding out for a night in a neighbour's apartment, listening to his own home being searched, Gouzenko finally persuaded the RCMP to look at his evidence, which provided proof of a massive Soviet spy network operating in western countries, and, indirectly, led to the discovery that the Soviets were working on an atomic bomb to match that of the Americans. In 2001, the old city of Ottawa (estimated 2005 population 350,000) was amalgamated with the suburbs of Nepean (135,000), Kanata (56,000), Gloucester (120,000), Rockcliffe Park (2,100), Vanier (17,000) and Cumberland (55,000), and the rural townships of West Carleton (18,000), Osgoode (13,000), Rideau (18,000) and Goulbourn (24,000), along with the systems and infrastructure of the Regional Municipality of Ottawa-Carleton, to become one municipality. Ottawa-Carleton used to be just Carleton County before 1969 and consisted of what is now the City of Ottawa except for Cumberland. The Parliament Buildings, shown here, are Ottawa's most famous landmark. Ottawa is situated on the south bank of the Ottawa River, and contains the mouths of the Rideau River and Rideau Canal. The oldest part of the city (including what remains of Bytown) is known as Lower Town and occupies an area between the canal and the rivers. Across the canal to the west lies Centretown (often just called "downtown"), which is the city's financial and commercial hub. Between here and the Ottawa River, the slight elevation of Parliament Hill is home to many of the capital's landmark government buildings, and is the Legislative seat of Canada. The City of Ottawa includes many urban areas. The main one extends a considerable distance to the east, west and south of the centre, and includes the former cities of Gloucester, Nepean and Vanier, the former village of Rockcliffe Park and the suburban communities of Manotick and Orléans. In addition to the main urban area, there is the Kanata urban area consisting of the urbanized part of the former city of Kanata and the former village of Stittsville (pop. 70,320). There are also a number of satellite towns and rural communities that are also urban areas (urban fringes) that lie beyond the greenbelt but are administratively part of the Ottawa municipality. These are Constance Bay (pop. 2,327); Kars (pop. 1,539); Metcalfe (pop. 1,610); Munster (pop. 1,390); Osgoode (pop. 2,571); and Richmond (pop. 3,287). Across the Ottawa River, which forms the border between Ontario and Quebec, lies the city of Gatineau. 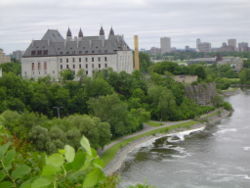 Although formally and administratively separate cities in two separate provinces, Ottawa and Gatineau (along with a number of nearby municipalities) collectively constitute the National Capital Region, with a combined population exceeding one million residents, and the area is considered a single metropolitan area. One federal crown corporation (the National Capital Commission, or NCC) has significant land holdings in both cities - including sites of historical and touristic importance. The NCC, through its responsibility for planning and development of these lands, is an important contributor to both cities. Ottawa itself is a single-tiered city, meaning it is in itself a census division and has no county or regional municipality government above it. 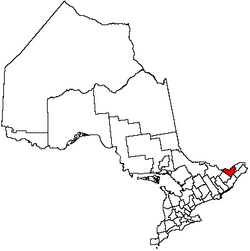 Ottawa is bounded on the east by the United Counties of Prescott and Russell; by Renfrew County and Lanark County in the west; on the south by the United Counties of Leeds and Grenville and the United Counties of Stormont, Dundas and Glengarry; and on the north by the Regional County Municipality of Les Collines-de-l'Outaouais and the City of Gatineau. Ottawa is made up of eleven historic townships, ten of which are from historic Carleton County and one from historic Russell. They are Cumberland, Fitzroy, Gloucester, Goulbourn, Huntley, March, Marlborough, Nepean, North Gower, Osgoode and Torbolton. Ottawa has a range of temperatures from a record high of 37.8 ° Celsius (100 ° F) in the summers of 1986 and 2001, to a record low of -36.1 °C (-33 °F) being recorded in the winter of 1943, the second coldest temperature recorded in a capital city (after Ulaanbaatar, Mongolia). This extreme range in temperature allows Ottawa to boast a variety of annual activities, and the requirement of a wide range of clothing. By annual average temperature, Ottawa is the seventh coldest capital in the world, however by mean January temperature, Ottawa ranks third behind Ulaan-baatar in Mongolia and Astana, Kazakstan. Snow and ice are dominant during the winter season. Ottawa receives about 235 centimetres (93 in) of snowfall annually. Its biggest snowfall was recorded on March 4, 1947 with nearly 2.5 feet of snow (73 cm). Average January temperature is -10.8 °C (13 °F), although days well above freezing and nights below -25 °C (-13 °F) both occur in the winter. The snow season is quite variable; in an average winter, a lasting snow cover is on the ground from late November until early April, although some years are snow-free until around or beyond Christmas. High wind chills are common, with annual averages of 51, 14 and 1 days with wind chills below -20 °C (-4 °F), -30 °C (-22 °F) and -40 °C (-40 °F) respectively. The lowest recorded wind chill was of -47.8 °C (-54.0 °F) on January 8, 1968. Summers are fairly warm and humid in Ottawa, although they are typically short in length. The average July maximum temperature is 26.5 °C (80 °F), although temperatures of 30 °C (86 °F) or higher occur frequently. A maximum temperature of 39.5 °C (103 °F) was recorded in the summer of 2005 at certain locations. During periods of hot weather, high humidity is often an aggravating factor, especially close to the rivers. Ottawa annually averages 41, 12 and 2 days with humidex readings above 30 °C (86 °F), 35 °C (95 °F) and 40 °C (104 °F) respectively. The highest recorded humidex was 48 °C (118 °F) on August 1, 2006. Spring and fall are variable, prone to extremes in temperature and unpredictable swings in conditions. Hot days above 30 °C (86 °F) have occurred as early as April or as late as October, as well as snow well into May and early in October (although such events are unusual and brief). Average annual precipitation averages around 943 millimetres (37 in.). The biggest one-day rainfall occurred on September 9, 2004 when the remnants of Hurricane Frances dumped nearly 136 mm (5½ inches) of rain in the city. There are about 2,060 hours of average sunshine annually (47% of possible). Destructive summer weather events such as tornadoes, major flash floods, extreme heat waves, severe hail and remnant effects from hurricanes are rare, but all have occurred before. Some of the most notable tornadoes in the region occurred in 1978 (F2), 1994 (F3, see Aylmer, Quebec) and 1999 (F1). On January 1, 2000, an earthquake measuring 5.2 on the Richter Scale struck Ottawa. However, it is very unlikely that F4 or F5 tornadoes like in the U.S. Plain States will occur since it is located much farther away from the interaction of the airmass from both the Gulf of Mexico and the Rockies, which can produce strong to violent tornadoes further south. On February 24, 2006, an earthquake measuring 4.5 on the Richter Scale struck Ottawa. On average, a small tremor occurs in Ottawa every three years. Ottawa is served by VIA Rail passenger service, a number of airlines that fly into Ottawa Macdonald-Cartier International Airport, and inter-city bus companies such as Greyhound through the Ottawa Bus Central Station. The capital city of Canada is also served by a network of freeways, the main one being provincial Highway 417 (called The Queensway), Ottawa-Carleton Regional Road 174 (Formerly Provincial Highway 17), and the newly constructed Highway 416 (Veterans' Memorial Highway), connecting Ottawa to the rest of the 400-Series Highway network in Ontario. Highway 417 is also the Ottawa portion of the Trans-Canada Highway. The city also has a few Scenic Parkways (Promenades), such as the Ottawa River Parkway, and has a freeway connection to Quebec Autoroute 5, in Hull. For a complete listing of the parkways and roads in Ottawa, see the List of Ottawa roads. Ottawa's main mass transit service is OC Transpo (provided by the City of Ottawa). The Ottawa rapid transit system includes the Transitway (a network of mostly grade-separated, extremely high-frequency, reserved bus rapid transit lanes with full stations instead of stops) and a light rail system called the O-Train (A new light rail system is being considered for connecting the north-south and the east-west sections of the city). Both OC Transpo and the Quebec-based Société de transport de l'Outaouais (STO) operate bus services between Ottawa and Gatineau. A transfer or bus pass of one is accepted on the other without having to pay a top-up fare on regular routes. The Rideau Canal, which starts in Kingston, Ontario, winds its way through the city. The final flight of locks on the canal are between Parliament Hill and the Château Laurier. 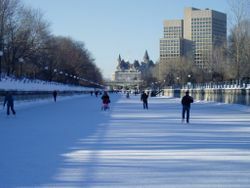 Also, during the winter season the canal is usually open and is a form of transportation downtown for about 7.8 kilometres (4.8 mi) for ice skaters (from a point near Carleton University to the Rideau Centre) and forms the world's longest skating rink. 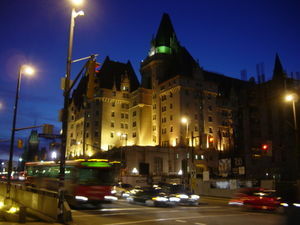 The Château Laurier in downtown Ottawa. The Canadian Museum of Civilization, across the Ottawa River in Gatineau, Quebec. The glass façade of Canada's National Gallery. 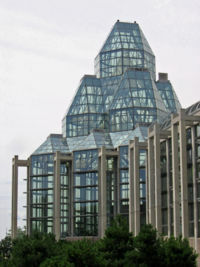 Federal buildings in the National Capital Region are managed by the Public Works Canada, while most of the federal lands in the Region are managed by the National Capital Commission or NCC; its control of much undeveloped land gives the NCC a great deal of influence over the city's development. Ottawa's primary employers are the Canadian federal government and the hi-tech industry. Because major companies have offices in the city it has become known as "Silicon Valley North." Ottawa is home to one major league sports team, the Ottawa Senators ice hockey team (established 1992) of the National Hockey League. The Ottawa Renegades (established 2002 - suspended operations 2006) football team of the Canadian Football League. The Senators play at Scotiabank Place and the Renegades played at Frank Clair Stadium. Ottawa was also home to a minor league baseball team, the AAA farm team of the Baltimore Orioles, the Ottawa Lynx of the International League prior to the 2006 sale of the team. Following its acquisition, the team has been affiliated with the Philadelphia Phillies, as their AAA affiliate, and the Lynx will be renamed on November 16, 2006. Under the terms of the sale, the Lynx will leave Ottawa following the 2007 season and begin play at Allentown's new Lehigh County Ballpark beginning in April 2008. 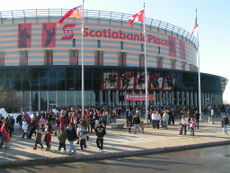 Scotiabank Place, where the Ottawa Senators of the National Hockey League play. Ottawa also has a major junior ice hockey team, the Ottawa 67's of the Ontario Hockey League. Ottawa's two major universities, Carleton University and the University of Ottawa both have athletic associations; the team names are the Carleton Ravens and the Ottawa Gee Gees respectively. Ottawa's top soccer team is the Ottawa Fury who play in the women's W-League and the men's USL Premier Development League. Harness and Horse racing can be found at Rideau Carleton Raceway off Albion Road and Auto racing can be found at the Capital City Speedway off Highway 7. Ottawa also has a professional women's hockey team, the Ottawa Raiders. Ottawa will be hosting the 2009 World Junior Hockey Championship . 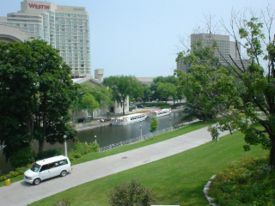 The city also supports many casual sporting activities, such as skating on the Rideau Canal or curling in winter, cycling and jogging along the Ottawa River, Rideau Canal, and Rideau River in summer, playing Ultimate all year round (especially through the O.C.U.A. ), skiing and hiking in the Greenbelt and the nearby Gatineau Park, and sailing on Lac Deschenes, part of the Ottawa River or golfing on many of the golf courses in the Ottawa area. During the coldest parts of winter there is ice fishing on the Ottawa river. Ottawa has many cricket clubs for people of all ages. In addition to being the capital of Canada, Ottawa is politically diverse with regard to local politics. Most of the city traditionally supports the Liberal Party, although only some parts of the city are consistent Liberal strongholds. Perhaps the safest areas for the Liberals are the ones dominated by francophones, especially in Vanier and central Gloucester. Central Ottawa is usually more left-leaning, and the New Democratic Party can win ridings there as government unions and activist groups are fairly strong. Some of Ottawa's suburbs are swing areas, notably central Nepean and, despite its francophone population, Orléans. The southern and western parts of the old city of Ottawa are generally moderate or slightly left of centre but periodically swing to the Conservative Party. The farther one goes from the city centre - into suburban fringes like Kanata and Barrhaven and rural areas - the voters tend to be increasingly conservative, both fiscally and socially. This is especially true in the former Townships of West Carleton, Goulbourn, Rideau and Osgoode, which are more in line with the staunchly conservative areas in the surrounding counties. However not all rural areas support the Conservative Party. Rural parts of the former township of Cumberland, with a large number of francophones, traditionally support the Liberal Party, though their support has recently weakened. Ottawa became the legislative capital of the Northwest Territories when it reverted to 1870 constitutional status, after Alberta, and Saskatchewan were carved out in 1905. From 1905 to 1951 almost all of the council members were civil servants living in Ottawa. From 1951 to 1967 the territory alternated legislative sessions with various Northwest Territories communities. Ottawa only held legislative sessions of the council. Fort Smith, Northwest Territories became the administrative centre and officially housed the civil service from 1911 to 1967. According to 2001 census data, there were 774,072 people, 310,132 households, and 210,875 families residing in the city. The population density was 278.6 people per square kilometre (721.6/ sq mi). Ottawa has the second lowest crime rate in Ontario. According to the census, there were 210,875 families, of which 72.8% were married couples living together, 11.1% were common-law couples, and 13.2% had a female householder with no husband present. The age profile of the city is spread out: 25.3% were under the age of 19, 6.9% from 20 to 24, 32.5% from 25 to 44, 23.8% from 45 to 64, and 11.5% who were 65 years of age or older. The median age was 36.7 years. For every 100 females, there were 95.1 males. For every 100 females age 18 and over, there were 92.1 males. The median income for a working individual in the city was $39,713, and the median income for a family was $73,507. Males had a median income of $47,203 versus $31,641 for females. The per capita income for the city was $23,061. 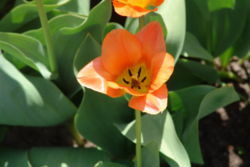 One of many tulips found along the side of Dow's Lake during the Tulip Festival (Ottawa). [ The Ottawa Lumière Festival ] is an annual festival that celebrates the magic and beauty of light! Funky costumes, beautiful hand made lanterns & over 100 performers fill the lovely Stanley Park, in Ottawa. Capital Pride is an annual festival celebrating the GLBT community in both Ottawa, Ontario and Gatineau, Quebec. Tulip Festival: each May Ottawa receives a gift of several hundred thousand tulips from the royal family of the Netherlands. The festival takes place in various locations throughout the city. Ottawa SuperEX is an eleven-day exhibition with entertainment and amusements that takes place every August. HOPE Volleyball Summerfest is the world's largest volleyball tournament with more than 25,000 players and spectators attending a gigantic beach party with funds going to local charities. Ottawa Chamber Music Festival is the world's largest festival of chamber music, held annually. Ottawa Bluesfest is an annual outdoor music festival, dubbed the largest blues festival in Canada. Ottawa Jazz Festival is an annual outdoor music festival highlighting local, national and international jazz musicians. Ottawa International Animation Festival is an annual international animation festival featuring works of the film makers from all over the world. The August Ontario civic holiday which is called Simcoe Day in Toronto and Peter Robinson Day in Peterborough is named Colonel By Day in Ottawa. The 43rd Ottawa and Carleton Battalion of Rifles was first permitted to adopt the motto "ADVANCE" and to bear the same upon its appointments in accordance with General Order - 82 dated 13 January, 1882. This motto has been perpetuated by all successors to the 43rd, including the Regiment today. It is the motto of the City of Ottawa. Although Ottawa is often associated with the Governor General's Foot Guards (who wear the distinctive scarlet tunic and Bearskin headdress, and parade regularly on Parliament Hill during the summer), the Cameron Highlanders have a special privilege: marching with bayonets fixed when they march through town. This is part of the "Freedom of the City" honour, accorded to the unit by the mayor of Ottawa in May 1969.